Two not-to-be missed spots in Istanbul are the Hagia Sophia (also spelled Aya Sofya) and the Blue Mosque. They are conveniently located near each other in the Sultanahmet area of Istanbul, which was the heart of ancient Constantinople. The Hagia Sophia. Without a doubt, this nearly 1,500 year old building is one of the greatest structures ever built. 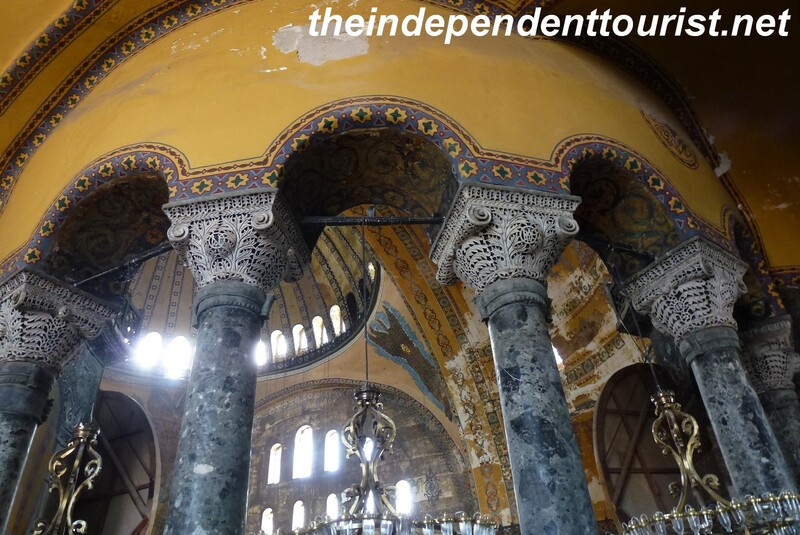 The great Byzantine Emperor Justinian consecrated the Hagia Sophia (Church of the Holy Wisdom) in 537 AD. It was originally a Christian church (the center of the Byzantine or Greek Orthodox church), and became a mosque in the 15th century after the Ottoman Empire conquered Constantinople. An exterior view of the Hagia Sophia. In the center right of the picture is the mausoleum of Murat III (died 1599) who had 103 children! The huge bronze doors through which the emperor would enter the church. 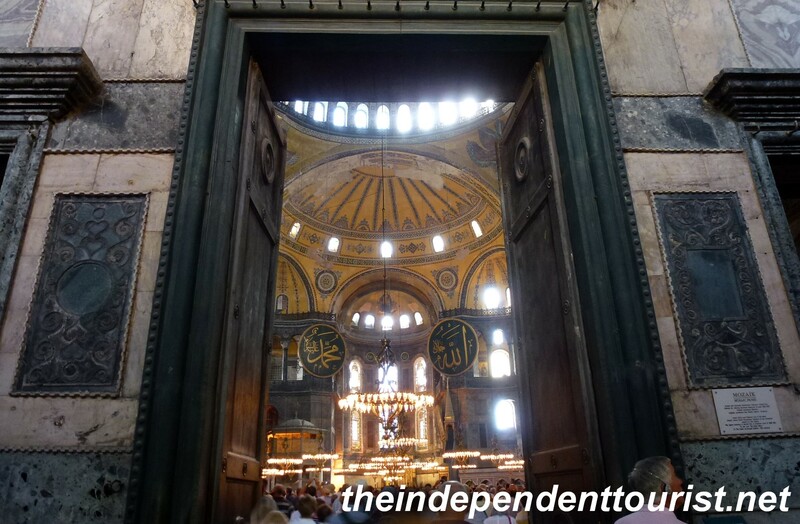 Byzantine Emperors were crowned here for centuries. 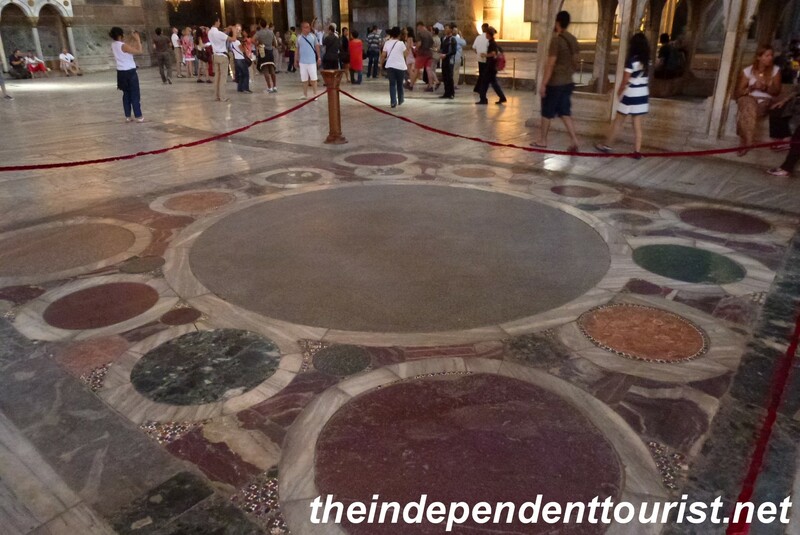 The spot where Byzantine Emperors were crowned for almost 1,000 years. The incredible nave of the Hagia Sophia. A building that is 1,500 years old has some pillars that are no longer vertical! A detailed view of several of the 67 columns in the 2nd floor gallery. The Venetians pillaged the Hagia Sophia in 1204 as part of the very strange 4th crusade, which ended up attacking Constantinople (center of the Eastern Roman Empire) rather than defending the Holy Land. 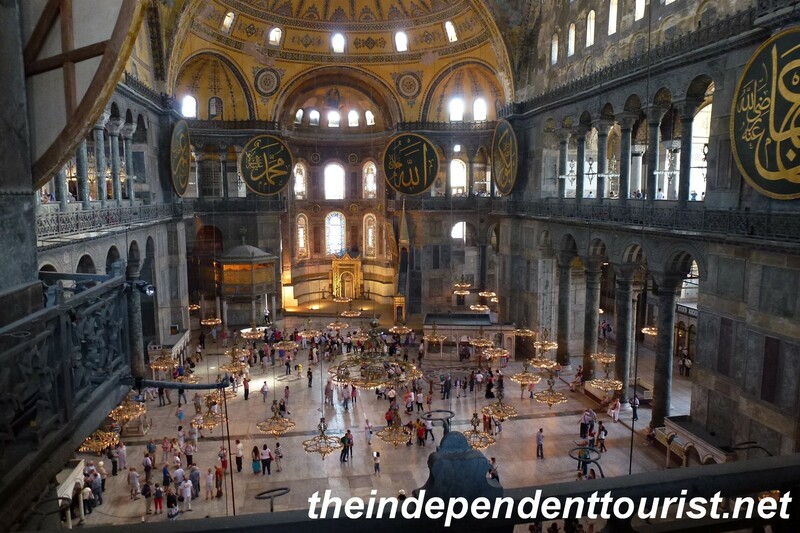 If you’ve read Dan Brown’s latest novel, Inferno, you will recognize that the Hagia Sophia plays a role in the story. 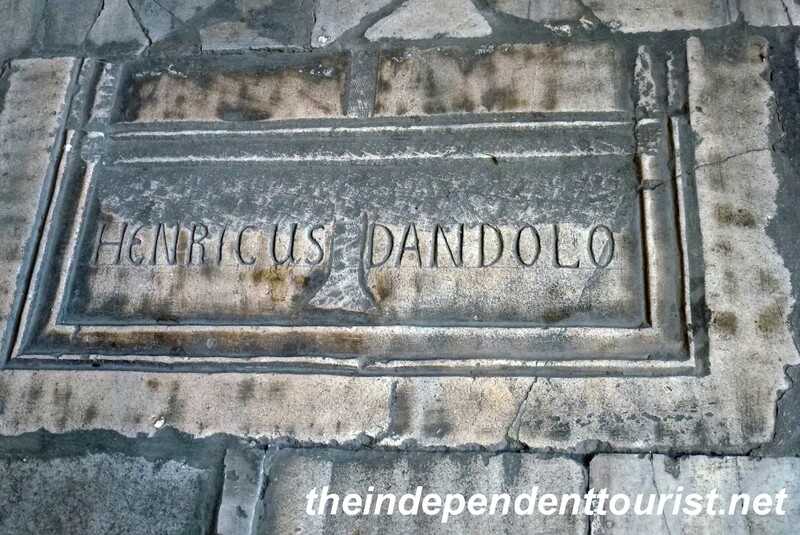 The Hagia Sophia contains the tomb of the Venetian Doge, Dandolo. He was 90 years old, blind and was the first to breach the defenses of Constantinople in 1204. There are a number of beautiful mosaics, a few from the 6th century and many from the 10th century onwards, many of which are on the 2nd floor. I was surprised at how the crowds visiting the Hagia Sophia thinned out when we ventured upstairs into the surrounding gallery. 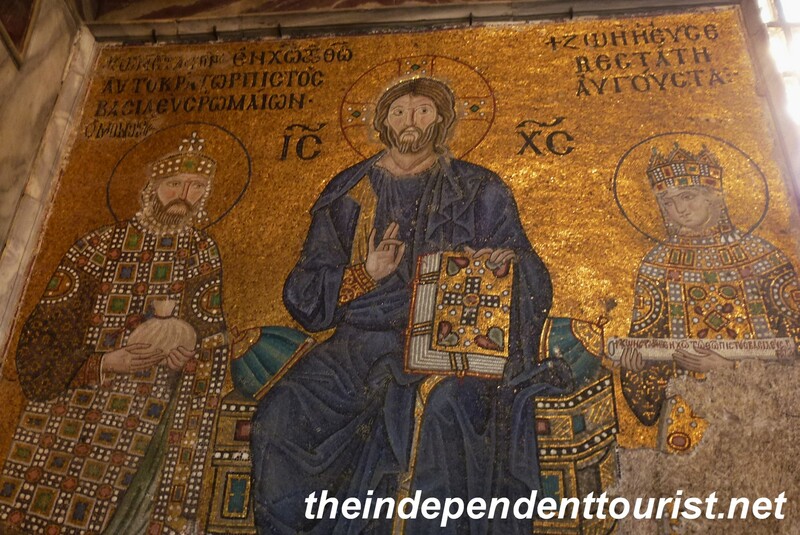 An 11th century mosaic of Christ with Emperor Constantine IX and his wife, Empress Zoe. 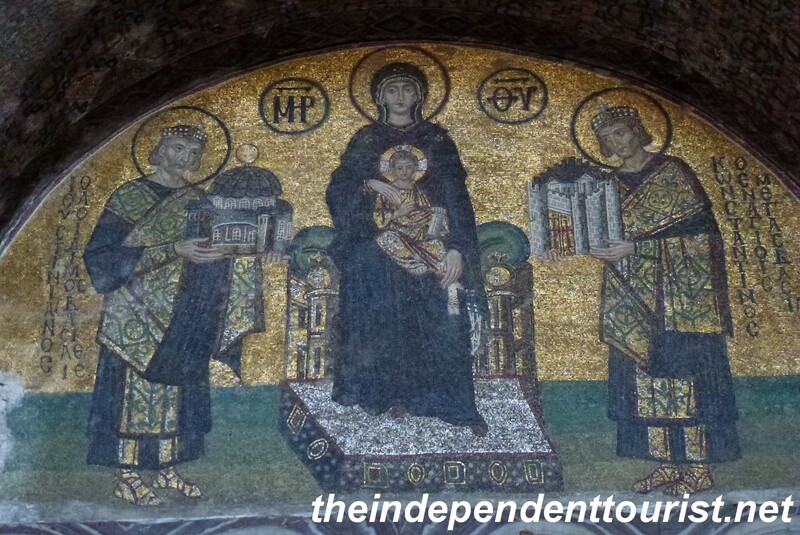 A 10th century mosaic of the Virgin Mary and Child with the Emperor Constantine on the right presenting the model of the new city of Constantinople and on the left the Emperor Justinian presenting a model of the new church, Hagia Sophia. Since this is THE sight in Istanbul, the lines can be long. 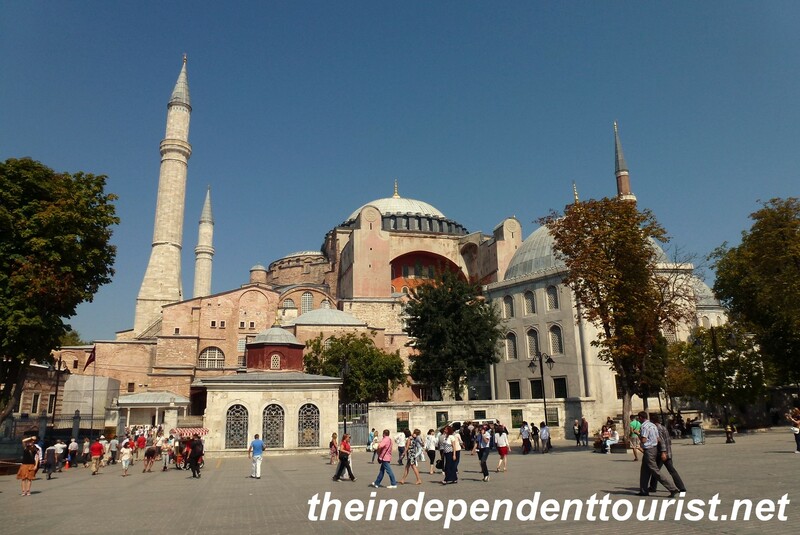 To avoid the lines, get the Museum Pass, which is sold in the plaza near the Hagia Sophia. As of September 2012, it cost 72 TL (Turkish Lira, about 2 TL to 1 USD) and is good for 72 hours. 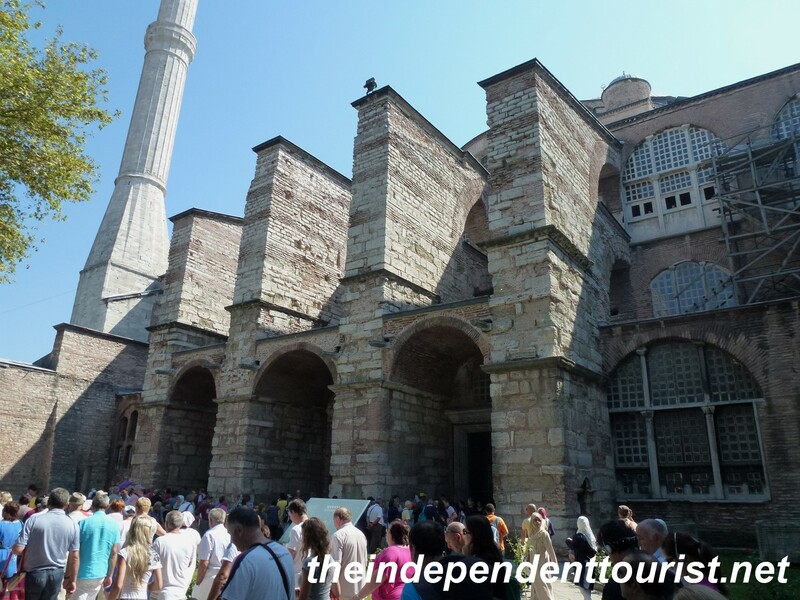 It allows you to bypass the crowds in line for individual tickets, saves money over the individual entry fees and gives you priority entrance into the Hagia Sophia and many other attractions. 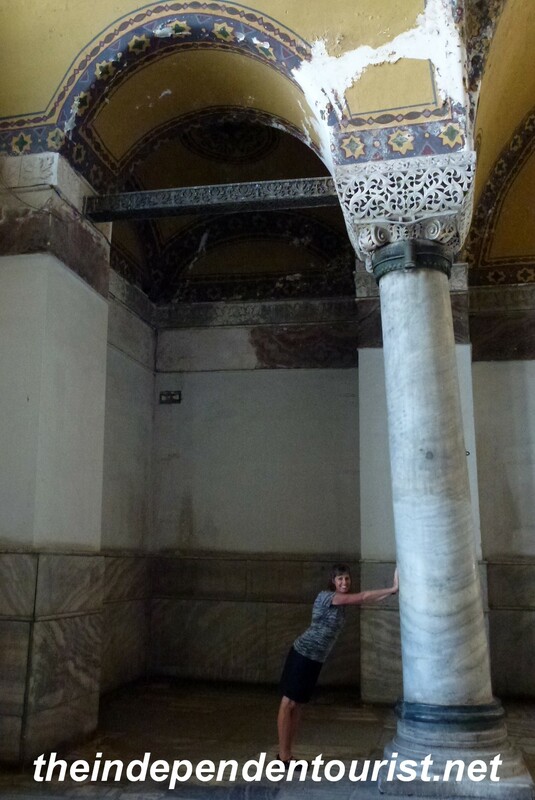 The buttresses helping to reinforce the walls of the Hagia Sophia. The visitor’s entrance is on this (western) side. The Blue Mosque. This mosque is another common image of Istanbul and is located just to the south of the Hagia Sophia. 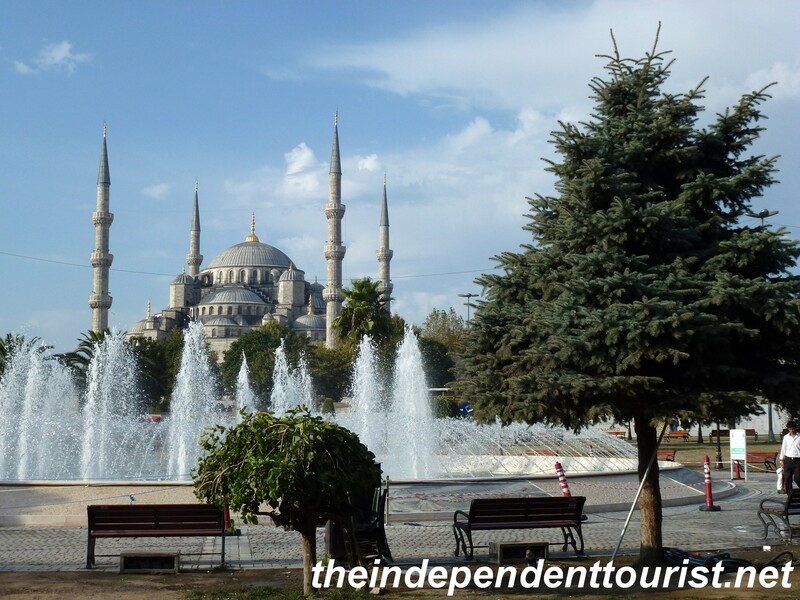 A view of the Blue Mosque from Sultanahmet Square, between the Hagia Sophia and the Blue Mosque. 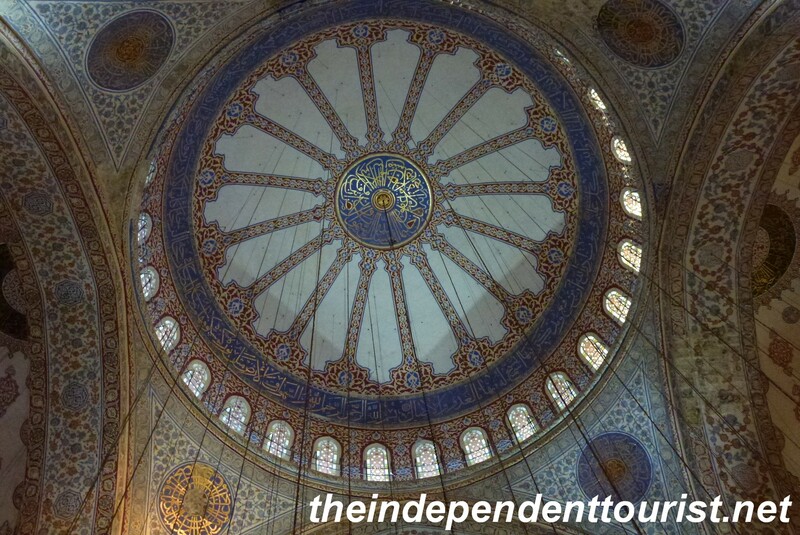 It is called the Blue Mosque due to the stunning blue tile work in the interior. The beautiful tiled dome of the Blue Mosque, looking up from the floor. Men washing before worshiping in the Blue Mosque. This is a “working” mosque, and therefore visitors are only allowed at certain times of the day around the Muslim worship services. 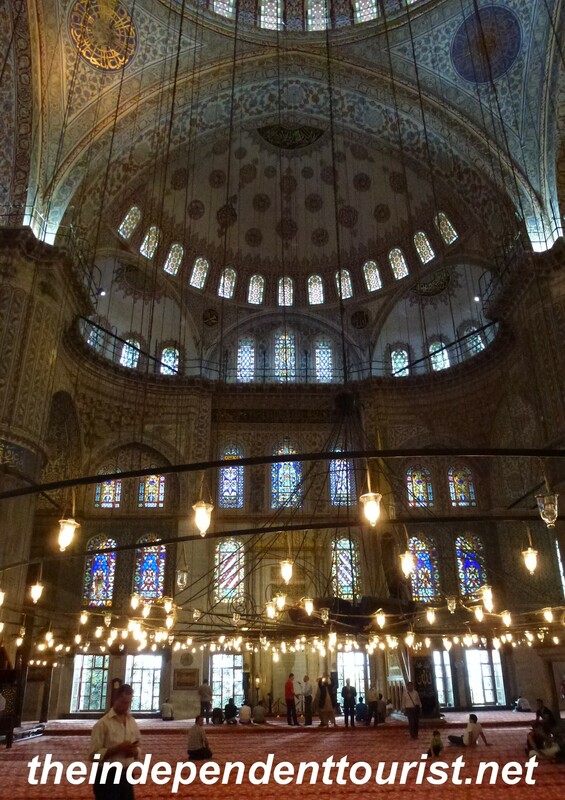 An interior view of the Blue Mosque. The Blue Mosque was built in 1609 – 1616. If you visit, wear appropriate clothing and be respectful of the Islamic faith by following the guidance/rules (taking off of shoes, women wearing a head covering, etc.). There is no cost for visiting the mosque. Take time to appreciate the artwork and architecture of this huge building. The courtyard of the Blue Mosque. The courtyard is about the same size as the Mosque itself. Note the cascade of domes above the courtyard. 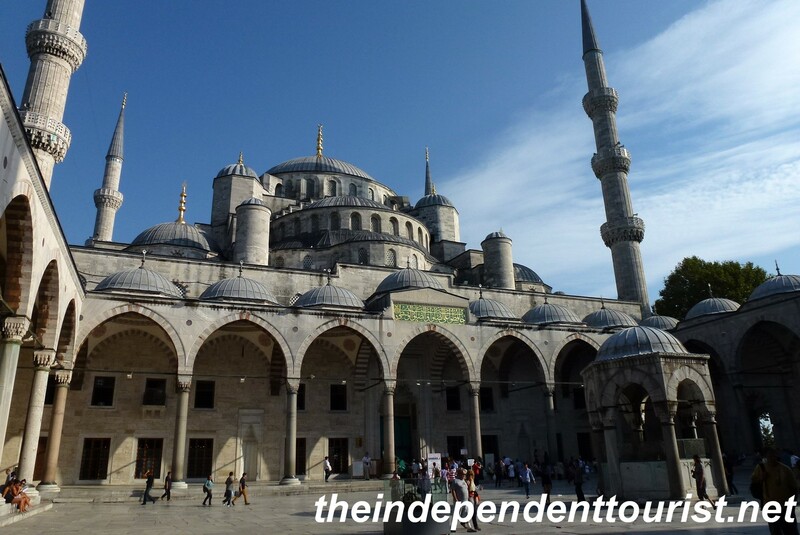 Posted in Turkey and tagged Blue Mosque, Constantinople, Hagia Sophia, Things to do in Istanbul, Things to see in Turkey, Visiting Istanbul on October 20, 2013 by Paul Terry.